It’s hard to imagine a Santa Barbara devoid of public art. No iconic Dolphin Fountain at the foot of Stearns Wharf, no solstice mural on The Granada garage, no rainbow arch Chromatic Gate sculpture along the waterfront, and no Pianos on State. The City of Santa Barbara provided $733,000 in grants to arts organizations this year to support the growth of the cultural arts economy, and provide free arts and cultural opportunities for the community, said Nina Johnson, senior assistant to City Administrator Paul Casey. “Beyond community enrichment and a sense of connection, public art and cultural activities provide a major boost to the local economy through sponsorships, sales, supplies and employee salaries,” she told Noozhawk. The City Administrator’s Office partners with the Santa Barbara County Office of Arts and Culture to oversee public art in the community. Most of it is funded by public and private partnerships, Johnson said. As the city considers projects to revitalize State Street, arts and culture efforts are underway. 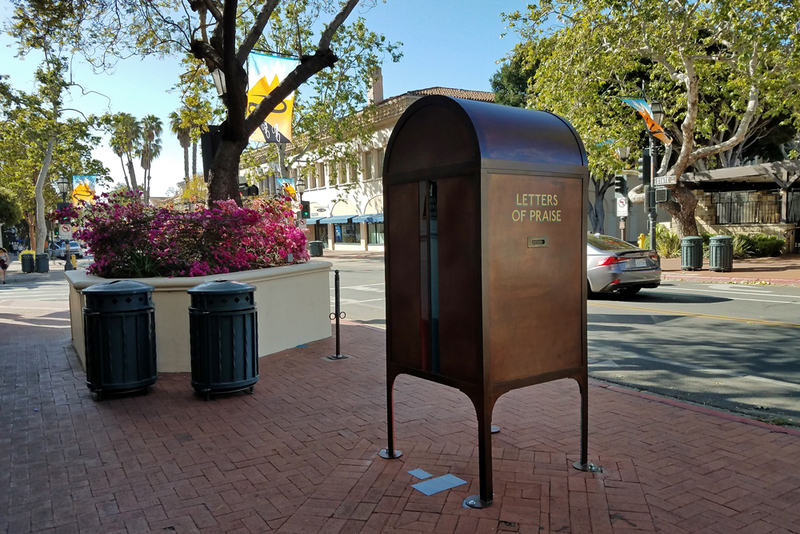 The city and county collaborated to install sculptures on State Street from April to June, and Santa Barbara officials want to use artwork to improve the State Street underpass at Highway 101 and build a better connection between downtown and the waterfront. “We want to energize this space so people see it as a destination and a gateway to the downtown area,” Johnson said. “We are planning to reconfigure the vehicle lanes to increase the space for pedestrians and cyclists. Other arts-related revitalization ideas for downtown are to erect art displays in vacant storefronts, install more art in public spaces, create a cultural arts master plan, and consider more arts activities and festivals downtown, according to Johnson. Arts and cultural opportunities are one primary driver to bringing people downtown, she said, so the city and various arts organizations are looking at ways to enhance offerings and plan more events. Santa Barbara Beautiful’s arts and culture committee has wanted a new cultural master plan for the city for a long time, said Nina Dunbar, a board member of the nonprofit organization. She said a component of such a plan would be to define guidelines, criteria and priority locations for future public art installations — both permanent and temporary displays to incorporate in the community. “Basically, Santa Barbara Beautiful would like to see public art not used as a Band-Aid for urban design problems, but rather a fully integrated strategy for enlivening the visual, social and economic vitality of our community,” Dunbar said. A 1980s Regional Arts Master Plan called for a multiuse center for artists to use as a gallery, workshop, rehearsal and performance space, and it took more than 30 years for it to come to fruition in the form of the Santa Barbara Community Arts Workshop at 631 Garden St.
“Public art is how we bring life to a city — it’s how we recognize our sense of place,” said Casey Caldwell, site manager for the CAW. The demand for a community space like the Community Arts Workshop remains today, he said. “The CAW is a response to the difficulty of artists having creation space,” Caldwell said. “Having space for the creation of public art is right at the core of our mission. It was one of the things recognized, especially because public art tends to be larger-scale, and you need a larger space. “There are maybe no, or virtually no, other spaces in town for artists in town to build big pieces,” he continued. 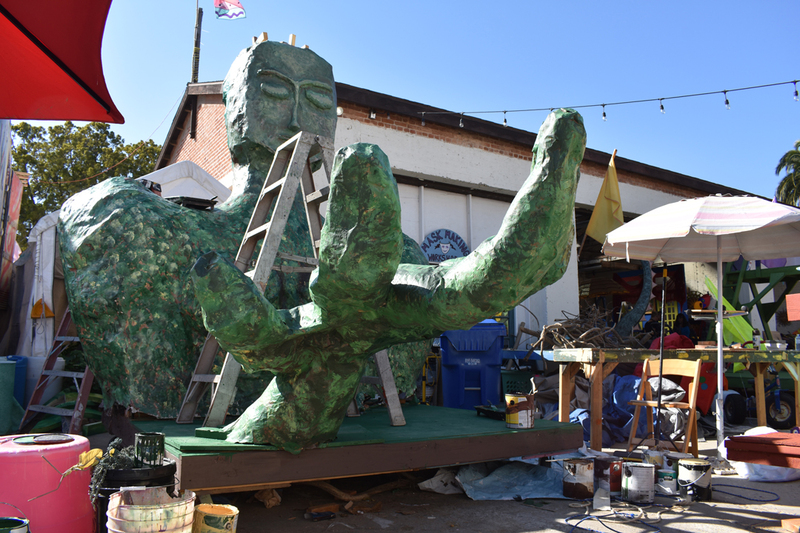 Some of those big pieces are seen by tens of thousands of people, since the CAW is also where artists gather to create costumes and creative floats for the popular annual Summer Solstice Celebration parade.